jennie's nails and tales: Diet Coke Detox, Complete! About 31 days ago, I was drinking a serious amount of Diet Coke. I'm not even going to tell you how much because it's kind of embarrassing, but rest assured that it was totally excessive and bordering on gross. This is pretty much what I was like, only I would be smiling. So, 30 days ago, I (along with The Remix) decided that we'd try to go a month without drinking soda of any kind. 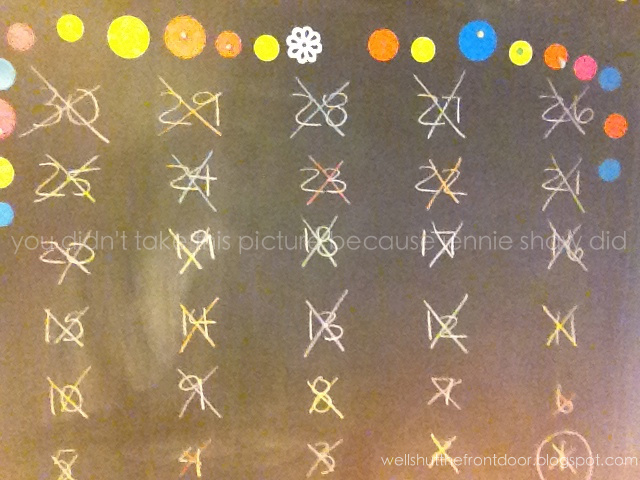 With squinty-eyed determination, we made a big chalkboard countdown in our main floor bathroom for motivation and cleaned out our stash (yes, I had a stash -- buying mass amounts when it was on sale and the hoarding it in every available space in the kitchen). The countdown almost took up almost the entire wall. I called it: In Your Face Motivation. Haha! At first, I wasn't sure that I was going to be able to do it and there were a few times I even dreamed about Diet Coke. Yeah, I know, it's totally sad. But, seeing that giant chalkboard really kept me focused and soon, we'd made it to the halfway point. I'll admit that I got a little bored of water around that time so I picked up some iced tea Crystal Light. Yes, there's some aspartame in that but no sodium, so I figured that an occasional glass would be okay as the focus of the 30 days was no soda. And I'm delighted to report that as of today, we completed our goal! 30 whole days with absolutely no soda of any kind! You best believe we be shaking it to celebrate. Truth be told, our ultimate goal was to stop drinking soda forever, but to go from having it all the time to suddenly NEVER drinking it was too intense of a concept, hence our 30-day countdown. And now that we've reached the end, I feel comfortable saying that I'll just keep doing what I'm doing. For me, drinking even a little Diet Coke could spurn a total relapse so although I'd like to say that I could have it occasionally, I know that probably wouldn't be the best bet for me. 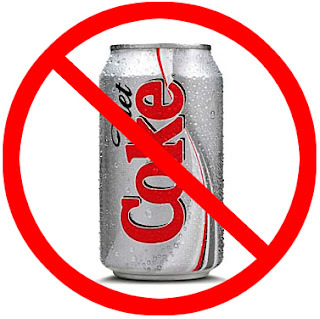 So, really, the only option is to remain a Diet Coke Free Zone. I should order this on a canvas or something and put it up in my house. Haha!! How do you feel about soda? Is it something you can have in moderation or are you a (former) addict, like me? And in a completely unrelated subject, have you entered my giveaway for a bottle of Initialiste by Kérastase? If you have thin, dry, breakable hair, this is something you'll absolutely want to try! 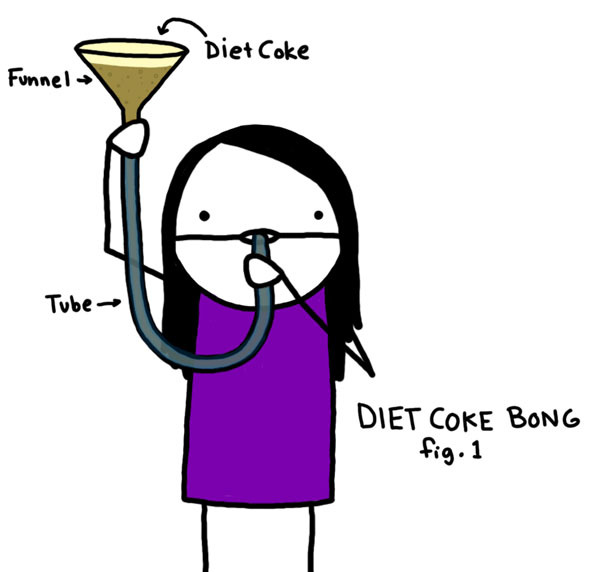 I actually cut back on Diet Coke recently, not for health reasons, but for financial ones. I decided I really couldn't justify spending $5+ a week on Diet Coke (tiiiiight budget here). So I stopped buying it. I would still drink it on the weekends if I was grabbing lunch at the food court (because of my second job), but I wasn't buying cans anymore. I started making pitchers of iced green tea (two green tea bags, one herbal fruit tea bag, a bit of honey) and drinking a water bottle of that every day. My boyfriend still buys me 12-packs when they're on sale, but instead of drinking 2-4 cans a day, I drink maybe 3 cans a week. Woohoo!! I was addicted to coke (the kind you drink...) as a teen, and went cold turkey. Oh, the headaches. I will drink it on occasion, but I definitely find that the more I have it the more I want it. Then I feel kind of gross after I drink it. I try to remember the astounding amount of sugar that's in it when I'm deciding whether or not I want it. That helps. CONGRATS!!!!! This is awesome! I've probably had 10 sodas in the last year (and only 1 non-caffeinated one since I got pregnant) and I haven't looked back. It's been great! I feel less like "OMG I NEED THIS." Hope you can keep it up too lady, so proud of you! Heavily addicted here. Buy the 12 packs on sale and hoard them too. I have been drinking much more water lately and I also really like Polar Seltzer and would like that to be the new 'Diet Coke' in my life. I'm sure I have metabolic syndrome. I don't see a reference to how many cokes you drank on the way to the END though.